Soft and cozy indoors, warm and safe outdoors — get the best of both worlds with these KoziKicks® active lifestyle slippers. You'll love how the soft yet durable upper is lined with plush faux shearling for breathable warmth indoors or out. The naturally contoured Flex Form sole is designed for a woman's foot, allowing for free range of motion with a fully cushioned insole for maximum comfort. The outdoor slippers' rugged, non-slip rubber grip adds safety to your step as the unique toe guard helps prevent dragging and excessive wear. Choose from 4 colors: teal, purple, grey or black. 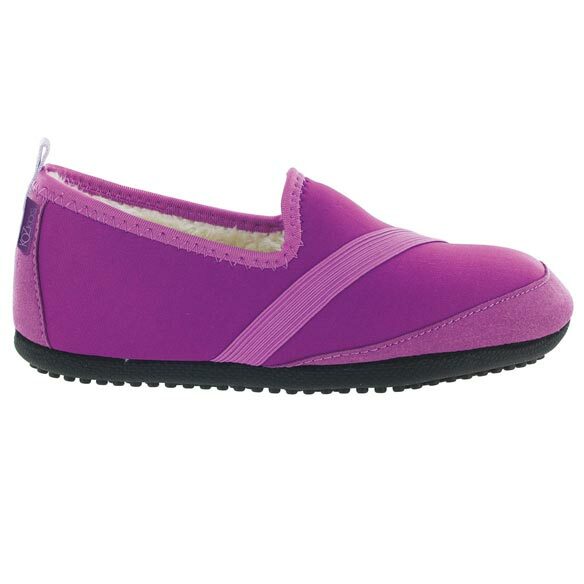 Women's slippers are available in 4 sizes: small (fits 5 1/2–6 1/2), medium (7–8), large (8 1/2–9 1/2), XL (10–11). Fits snug; order up a size. Hand or machine wash cold; air dry. I have a hard time finding comfortable slippers. These are so soft, keeps my feet nice and warm. You can wear them outside and they look like a casual shoe. When I put these on I thought they felt so nice. I had a little extra foot space at top. After wearing ten minutes I got severe cramping in both feet and had to hurriedly remove them as the pain was so bad. I got XL as I wear size 10. I cannot find a slipper that fits, and the ones without a back to the heel are not good as they push your foot forward and support is bad. I will hang in there and wear a few minutes each day to try to streatch them. Initially, when I put these on, they felt pretty comfortable. After one hour, I had to get them off. My feet were killing me. The bottom line is, they just do not fit me. I got the largest size as I am measured at a 10 W, but no help. Maybe others will have better luck. Very cute and I wish they worked. Would buy if more colors available!!!! red and navy!!! Daughter bought me a pair for Christmas!! I have neuropathy, numbness and pain!! These have been the only shoes/slippers I've been able to wear!! Absolutely love them!!! Wish there were more colors!! Been wearing these for a while. Love them! Good fit for a diabetic. hard shoes. This KoziKicks slipper/shoe is just perfect. ordered the black while the gray is drying after bath. I have a pair and they are extremely comfortable. Have problems with my feel and this has been the only houseshoe I can wear. I have purchased these before. They are the most comfortable, durable slippers I have ever owned (I am over 50 ). They actually make my footing more secure. They wash up beautifully. Be sure to wash in permanent press or delicate in cold water, let them air dry, and they will look and behave as if brand new! These are for my 95 year old mom who needs a small, comfortable slip on shoe or slipper for everyday wear. Have ordered before and love these slippers. Lightweight, but lining cushions entire foot. Wear them all the time at home and great to travel with. They are very comfortable and look good too! I have a pair and love them so much!! I bought a couple more as gifts. 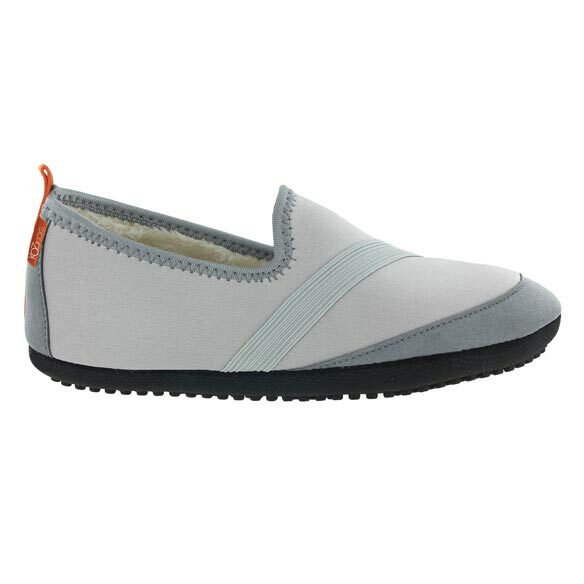 Slip on style, comfy, and durable! They're very cute and it'll be extremely comfortable. I have had these before and they are wonderful! these are the ones my mom wanted to try. My 98yr old mother loves these slippers. All her caregivers give this a thumbs up. My mother requires slippers that don't slip. Love kickfits and need new pair for winter. I gave my mother a pair of these 3 years ago and she loves them so much I've had to get her a pair in every color. She asked me to find some for my Aunt now so I've orderred these for her. I needed a slipper that has a heel as I have a problem with balance. They looked comfortable for indoors & outdoors. Most comfortable slipper for my feet. I am a diabetic. I saw them in a store and they did not have my style. Your site had what I needed at the correct price. Now I wear dear foams and these look like they will be as comfortable as what I am wearing now. BEST ANSWER: Thank you for your question. The medium will fit 7-8 shoe size. We hope this information will be of help to you. Looking for shoes for my elderly mother, who is a fall risk on smooth surfaces. Are these non slip? BEST ANSWER: Yes, they have a rubber sole with tread on them. These do tend to run a bit tight, but I have a wide foot. I do like these slippers. Yes. I use them in the house all the time, particularly for going up and down the basement stairs. Yes they are, bought them for my mother-in-law for Christmas and she loves hers! My shoe bottoms are slick, so I'd have to say No to these shoes being non slip. Yes, assuming you have a good fit. Is a med a size 6? BEST ANSWER: Thank you for your question. A Medium is sizes 7-8. A size 6 will be a small. We hope this information will be of help to you. Do you sell in pink any more on these KoziKicks? BEST ANSWER: Thank you for your question. We do not have these is pink. We apologize for any inconvenience. what is the width on an XL? BEST ANSWER: Thank you for your question. The width across the ball of the foot is basically 4 inches. It ranges from just under 4 to just over 4 across the size range S-XL.We hope this information will be of help to you. Yes, it was helpful. I would need at least 5 1/2 inches. It saved me from having to return a pair! Thank you so much for your help. What is shoe size for xl? BEST ANSWER: Thank you for your question. XL will fit size 10-11. We hope this information will be of help to you. I am an amputee, I wear an 81/2. What size should I order? Since I hope on 1 foot, would 91/2 be a firm fit for me? BEST ANSWER: Thank you for your question. We would recommend ordering the large size. We hope this information will be of help to you. BEST ANSWER: Thank you for your question. XL is shoe size 10-11. We hope this information will be of help to you.